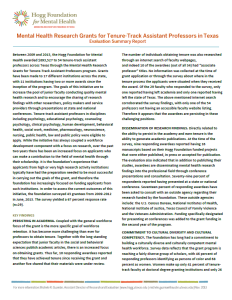 The Hogg Foundation launched the Mental Health Research Grants for Tenure-Track Assistant Professors in 2009 to increase the pool of junior faculty conducting quality mental health research and to encourage the sharing of research findings with other researchers, policy makers and service providers through presentations at state and national conference. The grants are awarded annually through an open, competitive request for proposals process. Typically the request for proposals is issued in late November. Sign up to receive notice of future grant opportunities and other news and information from the Hogg Foundation. Persisting in academia. Out of the 29 respondents, 10 reported having received tenure since the awarding of their Hogg grant, and another five shared that their materials were under review. Publication and dissemination of research findings. Nine respondents reported having 16 manuscripts based on their foundation-funded projects that were either published, in press or accepted for publication. A large majority of respondents reported having presented at a state or national conference. Leveraging of grant funds. Thirty-eight percent of awardees reported leveraging their Hogg grants to obtain other funding, thus furthering the impact of this grant program. Download the summary report of this evaluation.